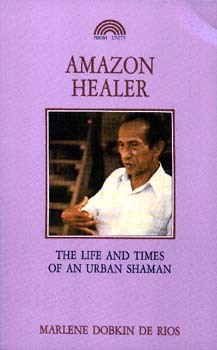 This book focuses on the healing practices of an urban Amazonian folk healer, don Hilde, who uses a powerful plant psychedelic, ayahuasca, in the treatment of witchcraft and emotional disorders. His healing syle is in many ways unique, since he incorporates a new spiritualist prespective into the traditional and cosmopolitan healing arts of the region. Amazon Healer examines traditional Amazonian healing practices, both as part of the region's tribal heritage and as the philosophy of a modern mystical group, The Septriionists. New breakthroughs in our knowledge of the immune system are also described, so as to help us understand how traditional folk healers, with their stimulation of endorphins and other unusual states of consciousness, can help patients invoke their own healing powers. Marlene Dobkin De Rios is a medical anthropologist, clinical psychologist and professor of anthropology at California State University, Fullerton. She is author of Hallucinogens: Cross-cultural perspectives, also published by Prism Press.